Most athletes know that carbohydrates are a critical fuel source during exercise. However, the role of protein is often misunderstood....not only by athletes, but by health care professionals as well (Wolfe RR, et al. 2008). In the following review, I will provide a perspective on protein consumption before, during, and after exercise. Before I summarize the recommendations for athletes and people who exercise strenuously, we need to review the current dietary protein guidelines in general, as there are some important principles to consider. Beginning in 1997, the Food and Nutrition Board of the Institute of Medicine (IOM) began publishing Dietary Reference Intakes (DRIs), a list of precise amounts for specific nutrients. These were developed to expand upon the "Recommended Dietary Allowance (RDA)" values which had been in existence for decades. Today, for many nutrients, in addition to the RDA, specific amounts exist for "Estimated Average Requirements," "Average Intakes," and "Tolerable Upper Intake Levels." I seriously doubt that your physician can explain these to you, and I'm certain that your personal trainer cannot. Protein intake is sometimes listed in terms of "daily servings," which is helpful, but most scientific resources use "grams per kilogram of body weight per day" (g/kg/day). So that we can make useful comparisons, I will use "g/kg/day" and focus mainly on the RDA in this review. Currently, the RDA of protein for adults is 0.8 g protein/kg/day, and this has been the guideline going all the way back to at least 1974. It is important to keep in mind that RDA's represent the minimum amount required to meet nutritional needs, not the optimal amount, as the name seems to imply (Wolfe RR, et al. 2008). Because of this confusion, it has been suggested that the term "Recommended Dietary Allowance" should be renamed "Minimal Daily Requirement" as that is a better description of what it really is (Wolfe RR, et al. 2008). In fact, some experts feel that the RDA for protein is too low to even meet minimal needs for the average adult (Wolfe RR, et al. 2008), and definitely too low for elite athletes (Wolfe RR. 2000). In one study, elderly adults who were maintained on 0.8 g protein/kg/day lost muscle mass after just 14 weeks (Campbell WW, et al. 2001). In 1989, researchers at Tufts University showed that distance runners required a minimum protein intake of 0.94 g/kg/day to maintain nitrogen balance (Meredith CN, et al. 1989), adding further evidence that the RDA value of 0.8 g/kg/day is not enough. In 1974, it was acceptable for protein to constitute just 8% of daily calories. As recently as 2000, the American Heart Association stated that a diet where protein makes up 15% of daily calories "should be adequate" (Krauss RM, et al. 2000). In 2005, the official Dietary Guidelines for Americans (from the USDA and the Department of HHS) modified protein recommendations from 12-20% of total daily calories (prior to 2005) to 10-35% (after 2005). In the September 2006 issue of the American Journal of Clinical Nutrition, Wolfe claims that the DRI's for protein intake from the Institute of Medicine are based on the wrong parameters: nitrogen balance studies, and, the development of disease. He points out that even in states of starvation, nitrogen balance can be maintained. And, regarding the development of disease, Wolfe argues that it just isn't logical to base guidelines for the general population on diseases that mostly occur in old age. Instead, muscle mass, muscle strength, and muscle function should be the focus for determining daily protein intake recommendations. He states that skeletal muscle is a vital reservoir of protein for the entire body (skeletal muscle contains 50-75% of the protein in the human body) and, if dietary protein intake is too low, then, muscle protein declines. And when this happens, health problems result. Men and women ages 70-79 yrs. in Pittsburgh, PA and Memphis, TN were followed for 3 years. Subjects who consumed the lowest amount of dietary protein lost the most skeletal muscle (Houston DK, et al. 2008). A sedentary lifestyle also has profound effects on skeletal muscle: Even in young healthy males, as little as 7 days of bed rest can substantially reduce muscle protein synthesis (Ringholm S, et al. 2011). Thus, when you combine aging with a sedentary lifestyle, it's not surprising that health issues arise. What this statement means is something like this: If strength training increases muscle mass by 5%, and an increased consumption of dietary protein increases muscle mass by 3%, then, doing both might produce a net increase of 8%. But, for many people, increasing dietary protein intake even without doing any strength training can increase muscle mass. Thus, this is another argument for increasing your daily protein intake. • In one study, neither muscle mass nor muscle strength improved further when additional protein was consumed immediately prior to and immediately after weight-training (Verdijk LB, et al. 2009). • In the other, the opposite result was seen (Holm L, et al. 2008). (This may be explained by the specific type of protein used in these 2 studies.....see below). A 3rd study evaluated the same amount (1.1 g/kg/day) in young males: muscle protein synthesis was enhanced during exercise, but not afterwards, if a carb+protein beverage was consumed (Beelen M, et al. 2008). So, if muscle protein synthesis "maxes out" at about 1.1 g/kg/day, why, then, does Wolfe (and others) suggest even higher daily protein intake? Answer: There is a dynamic relationship between the effects of exercise and dietary protein on skeletal muscle. "How" protein is consumed during the day, and, "when" it is consumed in relation to an exercise session are critical details. Note that a single exercise session can stimulate muscle synthesis for up to 48 hrs (Rasmussen BB, et al. 2003), however, when amino acids are supplied, muscle protein synthesis is stimulated for only 1-2 hours (Bohe J, et al. 2001) (Rasmussen BB, et al. 2000). Wolfe derives his recommendations from research showing that muscle protein synthesis is maximal after ingesting 15 grams of essential amino acids, extrapolating that to an equivalent amount of protein, and, then, assuming that this amount can be consumed multiple times per day (Wolfe R. 2006). Other research shows that muscle protein synthesis is maximum after a single 20 gram "dose" of protein (Moore DR, et al. 2009). This suggests that consuming massive single doses of protein in hopes of accelerating muscle growth is futile. Excessive intake of protein might instead be utilized as an energy source (see below). In other words, a higher daily intake of protein IS beneficial if consumed in small amounts multiple times per day. If Wolfe's recommendation of 1.8 g/kg/day seems high, note that in an 80-kg person consuming 2800 calories per day, this amount of protein would represent 20% of total daily calories, well within the 10-35% range currently recognized as acceptable. In healthy people, daily intakes of 2 g protein/kg/day pose no problems (Wolfe R. 2006). • Whey is a good source of branched-chain amino acids (BCAAs): Branched-chain amino acids are thought to be better at promoting muscle growth than non-branched chain amino acids. However, consuming individual branched-chain amino acids doesn't always work (Leenders M, et al. 2011). • Whey is considered a "fast" protein: After consumption, the amino acids in whey protein are released rapidly and make their way to hungry skeletal muscle cells quickly. In contrast, casein is considered a "slow" protein. This is because the amino acids in casein are released into the bloodstream (after digestion) much more slowly and over a longer period of time (ie., 6-8 hours). • When casein was consumed immediately prior to and immediately after weight training, neither muscle mass nor muscle strength improved further (Verdijk LB, et al. 2009). • In the other study, when whey protein was consumed immediately after weight training, muscle strength was improved (Holm L, et al. 2008). While several other variables might explain the different results seen in these 2 studies, it does suggest that whey protein is the preferred type of protein to consume immediately following a weight-training session. Nevertheless, despite casein's "slow-release" property, the consumption of casein immediately after exercise can still enhance muscle building (Levenhagen DK, et al. 2002). Unfortunately, commercial sports drinks don't always clarify the specific protein they contain. Note, however, that milk is a good source of casein and whey: the protein in milk is 80% casein and 20% whey. • Improved performance: Consuming protein during exercise can improve performance of that specific exercise session. And, consuming protein during and immediately following exercise can improve performance of a subsequent exercise session due to enhanced recovery. • Less muscle injury/soreness: Consuming protein during and after exercise has been shown to reduce muscle injury. • Reestablish energy stores: Consuming protein during and after exercise enhances the uptake of amino acids by skeletal muscle, but, also enhances the replenishment of muscle glycogen as well. It is important to realize that each of these 3 actions are interrelated to the others. Also, it's very difficult to assess the benefits of a high-protein diet on exercise performance without first considering the daily carbohydrate intake of the athlete. Now that we have a perspective on protein requirements for the average adult, we can discuss what athletes and those who exercise strenuously need. These guidelines are widely endorsed by sports nutritionists. Note, however, that these amounts are actually lower than what Wolfe recommends for the average adult (Wolfe RR. 2006). Additional recommendations are offered by Nancy Clark, MS, RD, in her best-selling book Sports Nutrition Guidebook, 4th ed. These are summarized in the table below. The diet providing the largest amount of protein (2.4 g/kg/day) did NOT increase protein synthesis more than the diet providing 1.4 g/kg/day. The excess dietary protein was, instead, used for energy (Tarnopolsky MA, et al. 1992). • 3 g/kg/day: Time-trial performance was better in elite cyclists when they were maintained on a daily diet of 3 g protein/kg/day compared to a diet providing half that amount. (NOTE: Their carbohydrate intake was 6 g/kg/day, and the researchers admitted that this might have been a bit low.) (Witard OC, et al. 2011). • 3.3 g/kg/day: However, in a separate study, performance was WORSE when cyclists were maintained on a daily diet of 3.3 g protein/kg/day compared to when they were consuming 1.3 g/kg/day (Macdermid PW, et al. 2006). This raises the question: was performance worse because protein intake was too high, or, because carbohydrate intake was too low? While the athletes were on the high protein diet, their carbohydrate consumption averaged 4.9 g/kg/day, which is considered low for elite aerobic athletes (Clark N. 2008). • weekend warrior, adult 1.0 - 1.5 g protein / kg / day Clark N.
healthy, adults 1.8 g protein / kg / day Wolfe R.
• growing teenage athlete 1.5 - 2.0 g protein / kg / day Clark N.
• To maximize athletic performance: Here the recommendation is much more fuzzy. First, "performance" can be measured in a variety of ways. For example, an NFL lineman wants to improve muscle strength, whereas a marathon runner is interested in muscle endurance. Second, performance is also dramatically affected by what you consume not only on a daily basis, but, what you consume during, and after exercise. And third, carbohydrate intake still needs to be considered, even if your protein intake has been optimized. Halson et al. showed that, when protein intake was 1.3 - 1.4 g/kg/day, a high carbohydrate diet was better than a low carbohydrate diet in cyclists during an 8-day high-intensity training phase (Halson SL, et al. 2004). To maintain muscle glycogen, daily carbohydrate must be adequate. Nancy Clark, MS, RD, suggests a range of 6-10 g carbs/kg/day. An elite athlete undergoing high-intensity training needs 8-10 g carbs/kg/day but the average weekend warrior doesn't need that much. Nevertheless, the principle applies to everyone: If daily carbohydrate intake is too low, then some of the protein that is ingested is converted to glycogen and burned for energy (Witard OC, et al. 2011). What happens when protein is ingested during exercise is very complicated (Koopman R, et al. 2004). How muscles utilize dietary protein is largely determined by how much carbohydrate is being consumed. During exercise, carbohydrates and fats are the 2 major sources of energy. Glycogen, a carbohydrate stored in muscle, is the primary source of fuel during short-term, intense exercise. Strenuous exercise can substantially deplete muscle glycogen after 1-2 hours. As the duration of a single exercise session increases, there is a gradual shift from carbohydrates (glycogen) to fats to meet energy needs (ie., the human body contains 60,000 - 100,000 kcal stored as fat, but only about 1800 kcal stored as carbohydrate). Thus, you must replenish carbs during a prolonged exercise session. While the amounts of carbs and fats used for energy vary depending on the type and duration of exercise, protein supplies a relatively small amount. According to Nancy Clark, MS, RD, only about 5% of energy comes from protein during exercise, however, John Ivy, PhD, and Robert Portman, PhD, in their book The Performance Zone (2004) state that as much as 15% of energy needs comes from protein. Regardless of the exact amount, the principle to keep in mind is that protein shouldn't be thought of as a primary energy source. Yes, amino acids can be converted into glycogen, but the best way to manufacture glycogen is to consume carbohydrates. • Consuming Protein During Exercise - Effects on Muscle Protein: Ingesting protein during exercise does enhance the resynthesis of muscle protein, but, the story is a bit complicated: It appears that protein synthesis doesn't increase in the hardest working muscle(s) until after exercise is over. Protein synthesis in other muscles, DOES increase while exercise is occuring if protein is ingested (Hulston CJ, et al. 2011). • Consuming Protein During Exercise - Effects on Muscle Glycogen: The relationship between dietary carbohydrates and muscle glycogen is pretty straight-forward: supplying carbs during (and after) exercise restores muscle glycogen. But insulin is required for this process and it turns out that ingesting protein along with carbs can generate higher insulin levels than after ingesting carbs alone.......up to a point (Miller SL, et al. 2003). Athletes and weekend warriors don't much care about the physiology of what is going on inside muscles. What matters to them is the effect on performance. So, does the consumption of protein during exercise improve performance? The answer is, "it depends"....ie., it depends on the amount of carbohydrates being ingested. Endurance Exercise: Two studies of elite cyclists reported that consuming a carb+protein sports drink during endurance exercise increased performance as compared to a carbohydrate-only drink (Ivy JL, et al. 2003) (Saunders MJ, et al. 2004). a) The rate of carbohydrate intake in these studies was too low: In the Ivy study, carbs were ingested at a rate of 47 g/hr (they used Accelerade®); the rate in the Saunders study was 37 g/hr. It is widely accepted that the optimum rate of carbohydrate intake for exercising muscles is 60 g/hr. Van Essen and Gibala found that when elite cyclists consumed 60 grams of carbs/hr during exercise, the addition of protein offered no improvement in performance over the carb-only sports drink. b) The exercise test did not mimic real-life competition: In the other studies, the athletes cycled at a fixed workload until exhaustion. Van Essen and Gibala felt that it was more realistic to have athletes cycle a fixed distance as fast as they could. To further simulate a real race, they had each athlete ride their own personal bike, not a laboratory bike, and offered monetary rewards to the winner. Thus, when carbohydrate intake was optimized (eg., 60 g/hr), and, the testing procedure more closely mimicked a real race, the addition of protein to a sports beverage made no difference.....at least, in terms of performance. The first issue is a practical one: The limit for sugar content for sports drinks is considered to be about 6-7%. Above that, GI emptying slows, increasing the risk for abdominal cramps, vomiting, etc. Cyclists might be able to tolerate higher concentrations, but runners may not due to more jostling of their internal organs while running. Ready-to-drink original Gatorade® ("Thirst Quencher") contains 5.8% carbs (14 g carbs per 8 fl.oz.). Using this product, an athlete would have to consume 34 fl. oz. per hour to meet the goal of 60 g of carbs per hour. This works out to roughly 8 fl. oz. every 15 minutes, or, 11 fl. oz. every 20 minutes. I talked to 2 elite athletes; one is a triathlete and the other is a cyclist. They both told me that they don't drink that much fluid during training or racing and felt that it would be tough to meet that goal. One solution (no pun intended) to this, is to use a more concentrated beverage, but, as the sugar concentration goes up, so does the osmolality of the sports drink and, also, the risk of GI intolerance. Thus, opting for a carb+protein sports drink might be a better choice. The second -- and, perhaps the more important -- reason to consume protein during exercise is that it may promote better muscle recovery. This appears to be the real benefit of consuming protein during exercise. Muscle damage is often assessed by measuring creatine kinase (CPK or CK) blood levels. Several studies in cyclists have shown that CK levels postexercise were lower if the athletes consumed a combination of protein+carbs during exercise, as opposed to only carbohydrates: In one study, CK levels were 83% lower (Saunders MJ, et al. 2004) and in another study, CK levels were 53% lower (Romano-Ely, BC, et al. 2006). a) Protein can improve performance: If your carbohydrate intake is not optimum, the additional consumption of protein offers another source of calories, and, in this scenario, protein can help improve performance. b) A combination of protein+carbs produces higher insulin concentrations: If carbohydrate intake is not optimum, then, consuming protein along with carbs can help to boost insulin levels higher. This may facilitate the uptake of vital nutrients into skeletal muscle. c) Protein reduces muscle injury and/or enhances recovery: Even if the addition of protein doesn't improve your performance, it is still possible that you might have less muscle soreness and may do well the following day due to faster recovery. This, in my opinion, is the best reason to consume protein during exercise. This research suggests that there is a critical level of carbohydrate intake: if carbohydrate intake during recovery is at least 1.2 g/kg/hr, then muscle glycogen synthesis is maximum and protein consumption offers no additional benefit. So, to summarize: Scientific research suggests that the optimum carbohydrate replenishment formula is at least 1.2 g/kg/hr, and this amount should be divided into 4 doses consumed every 15 minutes. And if this formula is followed, then the additional consumption of protein does not enhance glycogen resynthesis further. But, are these amounts realistic? Maybe not. In one study utilizing the ideal carbohydrate intake of 1.2 g/kg/hr, the athletes were required to consume 750 ml/hr (divided into 4 doses every 15 minutes) of a recovery beverage that contained 14.4% carbohydrates. Half of the subjects in this study complained of bloating and GI distress during the 4-hr recovery period (Howarth KR, et al. 2009). Exercise increases the rates of both protein breakdown and re-synthesis in muscle for up to 48 hours after a workout (Rasmussen BB, et al. 2003). Unless protein is consumed during recovery, breakdown will exceed synthesis, resulting in the loss of muscle mass. Protein consumed after exercise assists in the repair and synthesis of muscle proteins (Howarth KR, et al. 2009) and thus, is vital to the recovery process. To maximize muscle recovery after exercise, 3 factors must be considered: (a) how much protein to consume, (b) what type of protein to consume, and (c) when it is consumed. • AMOUNT of Protein: How much protein do you need to consume after exercise to satisfy muscle protein synthesis? Answer: Not much. One study shows that as little as 10 grams of whey protein was effective (Tang JE, et al. 2007). Another study showed that the effect maxed-out at about 20 grams of protein (egg protein was used in this study) (Moore DR, et al. 2009). However, the amount is probably less important than "when" it is consumed (see below). • TYPE of Protein: The effects of different dietary proteins on skeletal muscle can vary. Whey is generally regarded as the preferred protein for building muscle. It contains branched-chain amino acids (BCAAs), which skeletal muscle prefers, and, also, it is considered to be a "fast" protein.....ie., it is absorbed quickly, and, amino acids are delivered to skeletal muscle quickly. The uptake of nutrients by skeletal muscle is most active immediately following the end of exercise. Thus, to properly feed skeletal muscle, a "rapid acting" protein is needed. This role is filled by whey. Casein, on the other hand, is considered a "slow" protein. It is absorbed more slowly, releasing amino acids into the bloodstream for 6-8 hours after ingestion. The metabolic activity of skeletal muscle is elevated for 24-48 hrs after exercise ends (Rasmussen BB, et al. 2003). During this period, a steady supply of amino acids is needed. This role is filled by casein. Some experts have even recommended that casein should be consumed before going to sleep because of its sustained-release properties. One study comparing the response to milk protein (ie., whey + casein) against soy protein revealed that muscle-building was 34% greater after the consumption of milk protein than after soy protein. One way to explain this is that whey protein optimized the synthesis of new muscle protein while casein suppressed the breakdown of existing muscle protein. Soy protein does not offer this dual action (Wilkinson SB, et al. 2007), and, may even be detrimental: some research suggests that soy protein decreases testosterone levels (Weber KS, et al. 2001). 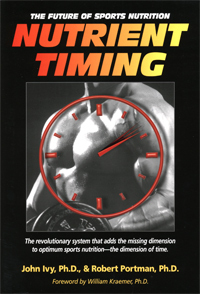 • TIMING: "When" protein is consumed after exercise is more important than "how much" and "what type" of protein to consume. Research shows that skeletal muscle cells uptake nutrients most efficiently within the first 30-60 minutes after exercise ends. Several hours later, this uptake process is greatly diminished. In one study, when recovery nutrition began 3 hours after exercise ended, the response was much less effective compared to beginning immediately after the end of exercise (Levenhagen DK, et al. 2001). "Consuming a poor-quality protein, such as corn, within 45-min after exercise ends will result in greater protein synthesis than consumption of a higher-quality protein, such as whey, if consumption is delayed by 2 hours." Putting all this into more simple terms: It is critical to begin consuming carbs and protein within 30 minutes after exercise ends. This is when skeletal muscle cells uptake nutrients most effectively. Because timing is so important, rapidly-absorbed nutrients are preferred: whey protein is ideal, and, high glycemic-index carbs are preferred. Also, small amounts at frequent intervals are more effective than a single huge dose. • Cyclists: Eight trained cyclists rode at a moderate pace for 2 hours to deplete muscle glycogen stores. During one trial, they were given a standard carb+electrolyte beverage afterwards. During the other trial, they were given a carb+protein beverage. They then did a high-intensity performance ride to exhaustion. After consuming the carb+protein beverage, the cyclists rode 55% longer (Williams MB, et al. 2003). • Distance runners: Distance runners were given roughly 600 kcal as carbohydrates only or 600 kcal as a mixture of carbs + protein after a strenuous glycogen-depleting run. After consuming the carb+protein recovery beverage, their performance during a following maximum effort run was 21% better compared to the carb-only beverage (Niles ES, et al. 2001). Within 30 minutes after a hard workout (Ivy and Portman suggest intake should begin within 15 minutes after exercise ends), athletes should consume 50-60 grams of high glycemic index carbs, and 12-15 grams of whey protein. whey 1.4-to-1 31-37 oz. 11-13 oz. To determine the carb:protein ratio of other commercial sports drinks, refer to the comprehensive table in my review: "Sports Drinks and Recovery Drinks". Note that a 12-oz. glass of milk combined with an additional carbohydrate source (eg., a bagel) might be just as effective as one of these commercial recovery drinks. If your intake of carbs is less than any of these amounts, then, some of the protein you consume will be burned for energy and not devoted to rebuilding muscle protein. In their book The Performance Zone, Ivy and Portman use the label "30W15" to describe how much and when to consume these nutrients: beginning 30 minutes before exercise and ending 15 minutes after exercise ends. They recommend consumption of both carbs and protein during this entire time frame. Whey protein and high glycemic-index carbs are preferred because they are rapidly absorbed. Glutamine is also recommended because it is the most abundant amino acid in skeletal muscle. for decades, official nutrition guidelines have recommended a relatively small amount of protein in the daily diet. Previously, I mistakenly interpreted the RDA to represent the "optimal" amount that we need. In reality, it represents the minimal amount necessary to avoid health problems. Robert Wolfe, PhD, makes the case that RDA recommendations for protein intake are based on the wrong criteria (see discussion above). Instead, he proposes that muscle function should be the focus. He states that health and disease do correlate with the functional status of skeletal muscle and suggests that the average adult's daily requirement of protein is closer to 1.8 g/kg/day (Wolfe RR. 2006) as opposed to the much lower RDA amount of 0.8 g/kg/day. The appropriate consumption of protein provides several benefits for athletes and those who exercise strenuously. Protein can supply the body with additional calories if carbohydrate intake is too low. However, the real benefit of consuming protein before, during, and immediately after exercise is due to the effects on restoring muscle protein, reducing muscle injury, and enhancing recovery. Thus, a theme begins to emerge: all adults (from sedentary people to serious athletes) might do better if protein intake was higher. The most recent Dietary Reference Intakes (2010) state that protein can make up 10-35% of total daily calories. Since there is no evidence of any problems with protein intakes as high as 2 g protein/kg/day (in people without kidney diseases), I have made the decision to reduce my daily consumption of refined carbs and try to consume good quality sources of protein at each meal. My goal will be 1.8 g/kg/day. And, after a hard tennis workout, I always try to consume a recovery beverage that contains a combination of carbs+protein. • Resistance Exercise vs. Consuming Protein: Resistance exercise (weight-lifting, etc.) and consuming protein can each stimulate muscle protein synthesis independently. However, this process is stimulated for up to 48 hours after resistance exercise whereas a single dose of protein stimulates it for only 1-2 hours. • To Optimize Athletic Performance: The first task is to evaluate how much carbohydrate you are consuming. But, regardless of that amount, consuming protein before, during, and immediately after exercise appears to have benefits. Opt for foods that contain whey protein, and/or commercial products that contain whey protein, essential amino acids, or branched-chain amino acids. • To Optimize Recovery: In addition to the recommendations above, make sure you begin your nutritional recovery regimen within 30 minutes after exercise ends. The combination of whey with casein is an ideal regimen for skeletal muscle recovery, however, when you consume protein (post-exercise) appears to be an even more critical factor. Q: Is milk an acceptable recovery drink? ANSWER: Yes. Sports nutrition research has led to a huge interest in "recovery" drinks for athletes. Commercial recovery drinks such as Endurox®, and, new products from Gatorade® are now widely marketed. (These are discussed in detail in: Sports Drinks and Recovery Drinks.) Milk is also an excellent choice for a "recovery" beverage. Milk contains roughly 1 gram of protein per fl. oz. and the carb:protein ratio is about 1.5-to-1. Milk is also much cheaper than commercial sports drinks: milk costs about $2 for a half-gallon. There are other reasons why milk is a good recovery drink. Milk contains 2 proteins: casein and whey. Recall that whey protein is a good source of BCAA's. But, the other protein in milk -- casein -- is also beneficial. It appears that whey helps support muscle-building while casein helps to inhibit muscle breakdown. Consuming milk protein after weight-training increased muscle protein synthesis 34% more than soy protein (Wilkinson SB, et al. 2007). So, the next time you need to refuel after a hard workout, consider a big glass of milk. Throw in an additional carbohydrate source (eg., a bagel) and you have a good recovery formula. However, milk also contains fat and, for this reason, milk is not a good choice for either before, or, during exercise. 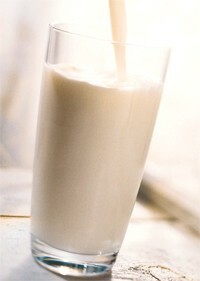 For more information, here is an interesting web site: www.RefuelWithChocolateMilk.com. • For Health Care Professionals: American College of Sports Medicine, American Dietetic Association, and Dietitians of Canada. Joint Position Statement: Nutrition and athletic performance. Med Sci Sports Exerc 2009;41:709-731. • For Consumers: The official Dietary Guidelines for Americans, 2010 can be found at the USDA's "Choose My Plate" web site. Sports Nutrition Guidebook, 4th ed. by Nancy Clark, MS, RD, one of the best-selling sports nutrition books of all time. Power Eating by Susan Kleiner, PhD, RD offers reasonably good nutrition information for strength athletes and body-builders. Advanced Sports Nutrition by Dan Benardot, PhD, RD is targeted to serious athletes. Sports Nutrition for Endurance Athletes by Monique Ryan, MS, RD is also another excellent book. per oz. 48 oz. 64 oz. 80 oz. Wolfe's target of 1.8 g protein/kg/day is ambitious, but anyone should be able to meet this goal without the aid of protein/amino-acid supplements, as the typical North American diet is rich in protein-containing foods. This adds up to a total of 124 grams of protein. Depending on your body weight, this would put you pretty close to Wolfe's recommendation of 1.8 g protein/kg/day. • tofu 9 g per 3-oz. Another way to increase your protein consumption without taking in too much fat is to use nutrition bars or protein drinks. Listed below are several that contain relatively higher amounts of protein. Make sure that you read the Nutritional Facts panel on the packaging closely. For example, note that PowerBar markets 3 different product lines all under the similar name "Protein Plus." Also, don't be misled by the product's name: South Beach's "Protein Fit" bars only contain a relatively low 9 g of protein per bar (these are not included in the table). I like the taste of Clif's "Builder's" bars, but they are very sweet. I recently tried PureFit bars (www.PureFit.com) during a hike at the Grand Canyon. They're not super-sweet, they don't contain high-fructose corn syrup or trans fats, and, they don't melt. But, my personal favorites are Odwalla Protein Bars, specifically the "chocolate chip peanut" flavor. They're not pasty, and, not super-sweet, though they only contain 7 g protein per bar. So, you can see that there are various ways to increase your daily protein intake without also increasing your fat intake. DISCLOSURE: Neither the author, nor, AthleteInMe, LLC, has any financial relationships with any of the manufacturers of products mentioned in this review that would be considered a conflict-of-interest.